Gorgeous Regency Manor House offers a quintessentially English stay in Cheltenham. The Park Hotel offers an on onsite Lakeside Restaurant with patio views of the Lake available in Summer. 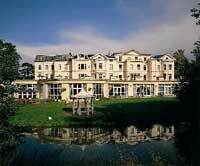 The 4-star Cheltenham Park Hotel is a magnificent extended Regency manor house nestling in its own secluded gardens and has a fabulous natural lake. Only two miles from the town centre and close to popular Cotswolds attractions like Chedworth Roman Villa and peaks like Cleeve Hill, the hotel offers 152 luxurious guest rooms and 68 Premium rooms that gently reflect the property’s original Georgian design. The double guest rooms are a mixture of American Oak and modern pine furnishings – an approach that manages to retain something quintiessentially quaint and English whilst other Barcelo rooms are decorated in warm contemporary colours. The on-site Lakeside Restaurant offers guests some truly first-class cuisine and the Lilleybrook Bar and Terrace have patio views of the lake and the golf course beyond it. The Park restaurant serves a class English menu and there is something to suit all tastes. The Barcelo’s well-equipped leisure club includes a 15m indoor swimming pool, spa bath, steam room, sauna, solarium, cardio vascular and resistance gym and beauty treatment rooms. Taking pampering very seriously indeed, Barcelo also offer Decléor therapeutic skincare, tanning treatments and Jessica Nails manicures and pedicures.